That is one ugly lookin' face. the MMX mangas were simply amazing, details everywhere, very well expanded story and violence. I prefer Ikehara's X adaptions. But this is still neat actually. Although I can't help but think that they're just looking for new ways to make their X figures sell, by introducing newer versions... If Metallic version was any indication of that. great, now they're pulling a capcom. throw on a fresh coat of paint, and sell it as something new, for the same price. resulting in instant $$$. Huh. Seeing them doing a comic version is kinda cool. Makes me believe they might be willing to do a RX or IX figure. What the hell is with that face? Don't give me "it's an anime face", I've seen anime dolls with much better faces than that! 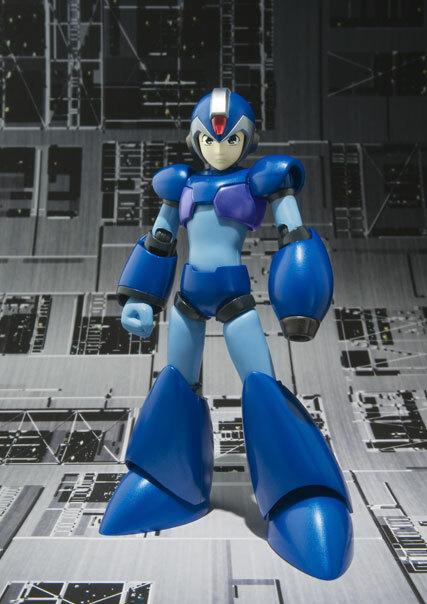 I love Iwamoto's Rockman X manga, but the face on this figures looks just weird. I'm good with my regular X. I'll pass on this one. Give me my Black square shoulder pad armor Zero! If Bandai's going to all this trouble making like platnium and different faced X figures, are there any plans for some X2 figures? An X2 full armor? Or an X1 Sigma? Eh? Eh? "Give me my Black square shoulder pad armor Zero!" Yeah I want this too. Preferibly the fake one with grey hair from X2. Y'know, I saw the SDCC version of X on sale at Disney Epcot (Japan) for $75. It was the last place in the world I expected to see a Japanese Rockman figure. Is this really a surprise? Bandai did the exact same thing with the previous line of X figures. There was one figure of Vile, one Bit, a couple of Return X/iX, three of Zero and over 30 variations on X. Enough with the repaints and armor variations. Give us some new characters.